Join Sumie at her dining table to enjoy a delightful and healthy meal with her and her family (when available) for a refreshing change from eating at restaurants. Sumie lives in a beautiful family town house with her husband, a daughter, two cats and a parrot. Visit them for not only a traditional home-style Japanese meal, but also a true glimpse of a Japanese family's home, life, and culture. Sumie can also show you how to wear a kimono as she is a licensed kimono dressing teacher! Sumie or her husband will meet you at JR Urawa station and together you will walk over to their lovely town house, a three minute walk from the station. 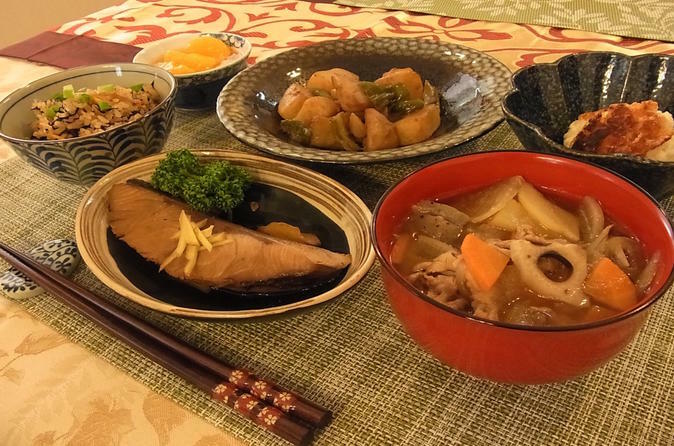 Depending on the day and season, Sumie may choose to offer you either a teishoku style meal that includes a main, soup and sides or a nimono, which includes slow cooked stews and sides. Dishes that she cooks include nimono (Japanese traditional slow cooked vegetable and meat stew), kaku-ni (slow cooked juicy pork, a signature Sumie dish) or grilled seasonal fish (black cod, mackerel or sea bream) served with takikomi-gohan (Japanese style pilaf) and miso soup. Sumie is open to requests and can serve a delightful vegetarian meal as well, if you're interested.